Lasercoil Technologies LLC, Napoleon, OH, has debuted its new coil-fed laser-cutting systems, designed to help companies achieve high yield rates that allows them to consider laser cutting of blanks in place of traditional blanking dies in stamping presses. The systems can be integrated with existing blanking-line automation, and also can be supplied with new automation as a complete line. 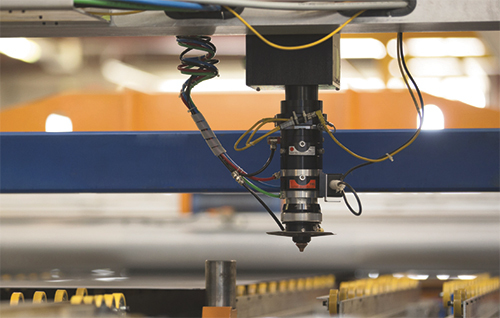 LaserCoil systems can process a wide variety of coil material in aluminum, mild steel, high-strength steels and other materials for surface-sensitive panels as well as structural components. Thickness capacity is 0.5 to 3.5 mm; maximum coil width is 2 m. Changeover is as simple as entering a new part number, vs. the significant time required for a die change. The systems are supplied with nesting and cutting software that optimizes material use. Contributing to the system’s speed is LaserCoil’s process, which relies on a series of dynamic profile conveyors that support the coil strip while providing a cutting path for the laser heads. These lanes independently and dynamically reposition to maintain a clear path below the moving laser head. This allows the coil to move forward through the system without jogging the strip back and forth, while also automatically shedding scrap during cutting. The result: burr-free, ready-to-stack parts at the end of the line. The laser cutting head, using linear-induction motors, delivers three axes of motion, enabling cutting of tightly nested, complex curvilinear shapes. The systems are available with single or multiple heads, which allows a shared balancing of the workload to decrease processing time and improve productivity. LaserCoil systems work with traditional feed and stacking equipment and can even be retrofitted to existing press-feeding lines.